Design experts say luxury is in when it comes to bathroom renovations. "Consumers are looking to create a boutique hotel effect in their bathroom, making strong design statements with freestanding baths and luxury details," said David Jacques, director of Jacques Designer Bathrooms. Details including contemporary bathroom vanities, whirlpool bathtubs, steam showers and televisions can create a hotel-style feel in a home bathroom. Many say that the recession and economic uncertainty may even be influencing the trend towards creating retreat-like bathroom spaces. Those who know they won't be able to spend money to travel to five-star hotels often are deciding to bring the luxury of their favorite vacation spots to their bathrooms. 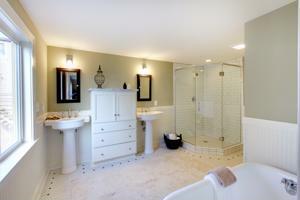 In addition, real estate experts say that luxurious hotel-style bathrooms are in demand among potential home owners. While making your bathroom space feel luxurious is often achieved by installing a stylish bathroom vanity, fixtures and accessories, it's also important to ensure there is adequate storage space to hide all toiletries and bath products. Even in a small space, choosing a furniture-like bathroom vanity that includes under sink storage and drawer space can help keep clutter to a minimum and enhance the space's luxurious details.